Sunday Brunches are fun. I always look forward to those. But when the venue for the Sunday Brunch is Hemant Oberoi at BKC Mumbai, naturally the excitement is doubled. As always, I was ushered in by name, made to be seated comfortably on a table of my choice and minutes later, was presented the menu. Cold foods were laid out on the buffet, which we were taken through painstakingly, while the hot foods were to be served at the table. Some pampering this! The spread looked inviting, presented with care and alluring to the core. One was clearly spoilt for choice. The red radish flowerpots were aesthetic to look at and equally delicate in their flavours. The soil made out of black olive dust and morrels took me by surprise. The avocado carpaccio was melt in the mouth and the fennel salmon boasted of distinct flavours. We were off to a good start. Our thyme and broccoli cappuccino arrived. Subtle flavours and a creamy texture enveloped my taste buds. The tortilla pizza was a pleasant surprise. Crispy, crunchy and palate-pleasing. Alok, serving us, was articulate, well-informed and explained each dish with aplomb, making our culinary journey even more enjoyable. The Har Go with mustard hollandaise was unique and the almost pillowy-soft har go just disappeared in a jiffy, as I relished the flavours on my palate. As if I was not already spellbound by these flavours, the ravioli parmigiana and the truffled scrambled eggs wowed my palate further. The leisurely pace of the brunch, where each course was served with sufficient gap, allowing one to savour each morsel, was a thoroughly enjoyable experience. Seductively spiced dishes, crunchy salads, creamy ravioli, which enliven your taste buds. That’s not all. The interesting bespoke twists are enough to tempt you. Few places are better suited to a luxurious Sunday Brunch than Hemant Oberoi. After all it is not everyday that you get to taste the food cooked by the maestro himself. At Rs 2950 plus taxes for this top-notch quality food and flavours, with a glass of beer, this one is no-to-be-missed. No, I am not in Tokyo, nor have I ever been there. But I was lucky enough to have a Tokyo-esque experience recently right here in Mumbai. Crepes have always been French and of course stylish and snobbish. Meant to be eaten in the proper way. Tokyo Creperie the newest entrant on busy and bustling Carter Road, Bandra has redefined crepes and made them more accessible and yes, flavourful. From sweet to savory, from the classic to adventurous, this place is perfect for a crepe indulgence. Started by two friends Saagar Panchal and Uzair Ansari, this Quick Service Restaurant (QSR) concept serves Harajuku-styled sweet and savory crepes, as a stuffed ‘on-the-go’ cone. Chef Anees Khan has created original Japanese crepes by infusing them with a wide selection of Indian flavors, combinations and toppings and that is what makes them stand apart from others. I began with a Chicken Cafreal crepe as it sounded intriguing. Oh! delicious it was. The crepe was soft and yet, well-done on the outside and the spicy and falvourful cafreal chicken a la Goa was generously filled inside the cone with lettuce, veggies, mayo et al. It was a light but satiating meal. Next came my chipotle chicken crepe which surpassed my expectations. Well-roasted chicken chunks, combined with veggies and a delectable sauce. The good quality ingredients ooze out of every bite and the presentation, entices you immediately. Butter Chicken, Chicken chicken peri peri popcorn, Fish Amritsari ,are some of the other options on the menu that struck me as interesting. What do I even say about my sweet crepe with Mango crème brulee custard ? It was pure sin. Creamy, sweet and luscious flavours enveloped my taste buds upon the first bite and rendered me speechless. Quite literally. Apart from these, Oreo biscuits along with other classic cookies, chocolates and ice cream have been turned into fritters, which make for crunchy desserts. There are fruity sodas too to quench your thirst. Saagar Panchal the co-founder was actually taking orders and explaining the concept painstakingly to consumers. “Crepes are traditionally a guilty pleasure or indulgent treat. We’re redefining the way people think about and enjoy crepes by using fresh, unique ingredients you can feel good about eating,” he said. There is something for every palate here. The crepes are affordably priced and perfect for a grab and go tasty treat as these are non-messy. Gokul is a name many of us in Mumbai are familiar with. A place in Colaba which has been around for decades and is known to be a hotspot for good quality and wholesome, Mangalorean food and drinks. Dinesh Pujary and Vandana, the son and daughter of Mr. Jaya Pujary, the founder of Gokul, have started Gokul 9 a small, but cosy vegetarian eatery in the adjacent lane. The place is colourful, has vibrant and aesthetically done interiors and spells comfort from word go. The menu is exhaustive and one is spoiled for choice. While there is a large section of South Indian delicacies, there is comfort food galore- soups, burgers, pav bhaji, sandwiches, pizza, and even a thali. There is something for every palate and age group. The South Indian food here is unarguably the piece de resistance. The aromatic hing in the piping hot sambhar wafts through the air even before you taste a spoonful. The flavours are spot on and the chutney is comforting as it is replete withe home style flavours. Palak dosa, cheese bhaji dosa, butter spring dosa, are worth a try as these are innovative albeit with a traditional touch. The masala dosa of course is the all time winner on the menu. The cheese khada pav bhaji is indulgence personified and not-to-be-missed. The Mumbai Special section with favourites like sabudana khichdi and misal pav will make you nostalgic. Among starters, the mushroom manchurian and soya bean chilli dry, are unique. For those seeking a quick bite, sandwiches, burgers, pizza options abound. Office goers throng to satiate themselves with the value-for-money thali. Rotis, rice, Indian gravies, Chinese dishes, too find a place on this varied menu. Round off your sumptuous meal with a refreshing and creamy kulfi. No alcohol here of course but juices and milkshakes aplenty to choose from. The food here is fresh, made with good quality ingredients and easy on the stomach and wallet. Nothing causes discomfort and uneasiness. The kitchen appears squeaky clean and hygienic. The service staff is warm, polite and alert. One literally feels at home here. I left with a smile of satisfaction. Indian food when dining out is usually my last choice, even though, I am passionate about the flavours of Indian food of every region. It is the greasy curries, oily biryanis, heavy kababs that scare me. Else, Indian food is food for my soul and I relish its flavours with pride. But home cooked food Indian food is what I hanker after. A new menu tasting session with Chef Mohamed Danish, the new Chef de cuisine at Kangan, Westin Mumbai Garden City, sounded exciting and naturally the gourmand and writer in me wanted to explore it, so I set out, albeit with a bit of trepidation. Chef Danish, I learnt, is a Lucknow born and bred Chef and naturally then, his culinary legacy is rich and varied. Of a pleasant demeanour, soft spoken and extremely confident of his food and skills, he demonstrated that in ample measure over a lunch experience that spanned three hours. No, it was not only about endless dishes, but conversations and stories around the food that made time simply fly and kept us engrossed. Awadhi cuisine was what we were primarily being treated to, as those are the highlights of the new menu, which will of course contain other dishes too, to wow many a palate for dinner. The culinary gems one can expect in an Awadhi meal are unmatched, especially delectable meat dishes including biryani, Nalli nihari, kakori kababs and more. Greatly influenced by Mughal cooking techniques, Awadhi food bears similarities to the cuisines of Persia, Kashmir and Hyderabad. The richness of Awadhi cuisine also lies in liberal use of ingredients like mutton, paneer and rich spices including mace, cardamom and saffron. Slow cooking with the finest ingredients, magically bound together, is the cooking style that is popular and Chef Danish strictly adhered to that. Some of the major spices that go into the legendary spice mixes in this cuisine are – black and green cardamom, cinnamon, bay leaves, black peppercorns, cumin, nutmeg, mace and cloves. The rakabdars or gourmet cooks, had their spice mixes, which were a closely guarded secret. In the past, all these spices were added in proportions that were easy on the stomach. Meat typically used to be marinated in curd and spices. This helped to soften the taste and texture, as well as remove any strong odours. Innovation was constant in the kitchens, as Nawabs were very easily bored and thus demanded constant innovation from their cooks, who obliged. Chef Danish seems to have inherited this trait as he is inventive to the extent of experimenting without altering the classics. We started with the aromatic and creamy, Murg zafrani shorba, but sans any cream. Flavourful as it was slow-cooked, it boasted of spices and the caramelised onions imparted a unique flavour. The Kangan tandoori chicken came next, with a lot of fanfare, being served to us fresh on our table. The aromas wafted through the air and made us hungrier, than we were. A bite into it and the smoky and well-balanced flavours, wowed my palate. The refreshing lemon grass shikanji, I thought was an apt and interesting combination for this summer heat and refreshing, as nothing else. The Kakori kabab was one of the best ever, as it was completely melt-in-the-mouth, well-spiced and yet, nothing overpowering. The dudhiya kabab made with grated paneer and dry spices, was for me, the piece de resistance. The melange of textures and flavours, so distinct, set it apart. I had never tasted anything like this before. Carnivores would gladly give up meat if this is served to them. The vegetarian variety on the new menu is abundant. The firdausi bharwaan aloo is equally a palate pleaser. Each dish looked as good as it tasted, as Chef Danish displayed his mastery over his craft. The andaaz of balancing the spices in this cuisine is an art and intrinsic to the flavours and Chef Danish has got it right. For mains, we sampled the quintessential favourite – dal Kangan, murgh Begmati, nalli nihari, murg Jahaangiri raan, papad and sev ka paratha, multigrain roti and more. The fragrant gucchi pulao with stuffed morels was an unparalleled treat. For once, with a heavy heart, I skipped the biryani. We rounded off our meal with the delectable shahi tukda, made with in-house saffron infused bread. In keeping with the Lucknawi tehzeeb and adab, none of the dishes had whole spices that one needed to remove. Apparently, that is how the Nawabs liked it – well-spiced food, prepared with a plethora of spices, but all removed after the cooking process before being served. Having tried multiple dishes, albeit small tasting portions, I did not experience the discomfort and uneasiness I was anticipating. That itself was the acid test for me. Quite literally. It was an enjoyable afternoon, where humne shauq farmaya, and we experienced lazeez food with lajawaab hospitality. Oops! I am beginning to sound Lucknawi is it? That is was this food and culture does to you, I guess. If you remotely love Indian food, this new menu at Kangan, is a must try. Allow Chef Danish’s culinary treats to pamper your taste buds. Dining in Goa is always a pleasure, as is visiting Goa. However, on my recent trip to my favourite State, I was in for an experience that took me by surprise. This hidden gem at Cidade de Goa, called the Alfama is a place I had never visited before and was mesmerized the moment I entered. Designed around Lisbon’s bohemian old town, this charming place is romance and warmth personified. The lively ambience is infectious and transports you to another world altogether. The pristine white balconies, further enhance the charm. The menu is essentially offers Portuguese Goan and Konkan food with a modern presentation and a degree of inventiveness. I was fortunate to have a special menu curated for me by Executive Chef Sunit Sharma and his team. The pineapple sansav and papad kismur started off our evening on a delicious note. A degustation experience was what we had embarked upon. The sansav teased my taste buds with its tangy and tart flavours while the papad kismur offered the right bite. The futi kadi proved to be the perfect way to stimulate my appetite and the fact that it contained no coconut milk made it even more lighter and refreshing. What is a Goan or Portuguese meal without a macaroni soup? The first sip brought back a host of memories. It was comforting all the way. The surmai recheado got my vote instantly both for its flavours and innovation. What does one even say about rawa fried prawns? Succulent and lip-smacking these were fried to perfection and the rawa crust was well-spiced. The lobster balchao on tarts I thought was a good spin on the usual prawns balchao. Foddi with a banana and potato variation, were crispy and a snack I could never have enough of. Each dish was distinct with authentic flavours oozing out of every bite. I devoured each one with pleasure, many of them making me take a trip down memory lane. Some of these were familiar and strongly reminiscent of what one is used to eating at home. The chicken cafreal stuffed in the poee was delightful and paired well with the poee. The spice levels were just right and the flavours, balanced. The meal was a surreal experience and what added to the memorable evening was the live music by the Cotta trio- father and his son and daughter, who were a melodious trio. They serenaded each guest on their tables with music of their choice. The first Tuesday of every month is a Fado night. Alas! I wish I was in Goa on one such night to enjoy the music. Enjoyment tonight, seemed a mild word to describe what I was experiencing. The shrimp curry with Goan rice sadly paled in comparison to the the other offerings. The dessert platter comprised bebinca, the tedious, layered dessert which is synonymous with Goa, alle belle the jaggery and coconut pancakes and Manganem or the payasam which is typically a Saraswat dessert. Each of these was well made and offered distinctive flavours and textures. I marveled at the Chef’s ability to integrate local flavours and ingredients in a contemporary manner yet, giving us a true Goan/Portuguese experience. Coupled with impeccable but unobtrusive service, this meal proved to be one that I will cherish for a long time. Ferry Wharf in Bandra Reclamation is a hidden gem waiting to be discovered. A bright and cheerful eatery with a warm vibe and colourful decor awaits you. The menu is replete with Mangalorean fare but it is the thalis priced affordably that caught my eye. Seafood is obviously their focus and the quality is numero uno- fresh and delicious. The fish, prawns and clam thalis are full fledged value for money meals. I opted for the prawns thali- my perpetual weakness. 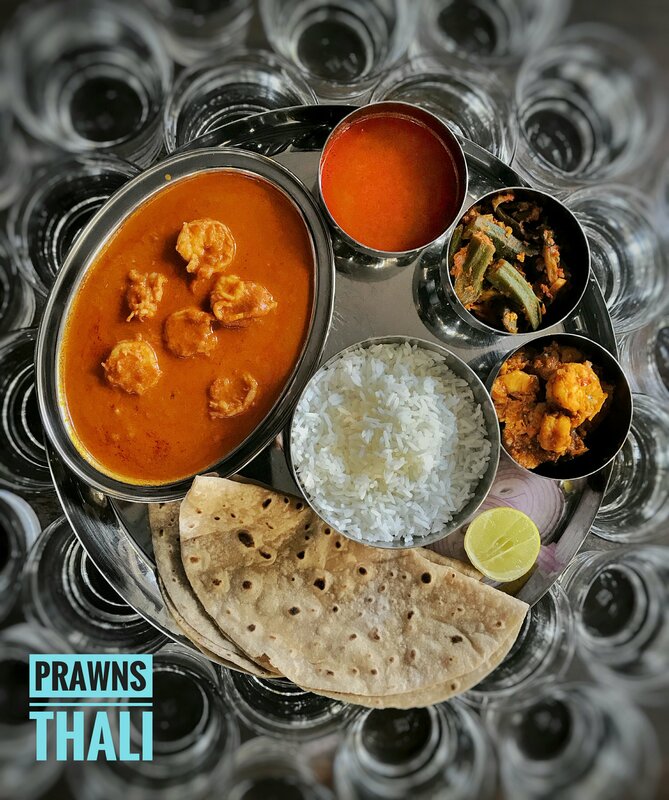 The thali comprised rotis, rice, vegetable of the day, prawns in a delectable gravy, tomato saar and fried prawns. The succulent prawns screamed freshness and were flavourful. The curry was home style and comforting. One can also settle for the clam thali with clams marinated in herbs and spices. Fish lovers of course can treat themselves to the sumptuous fish thali. Vegetarians fret not. 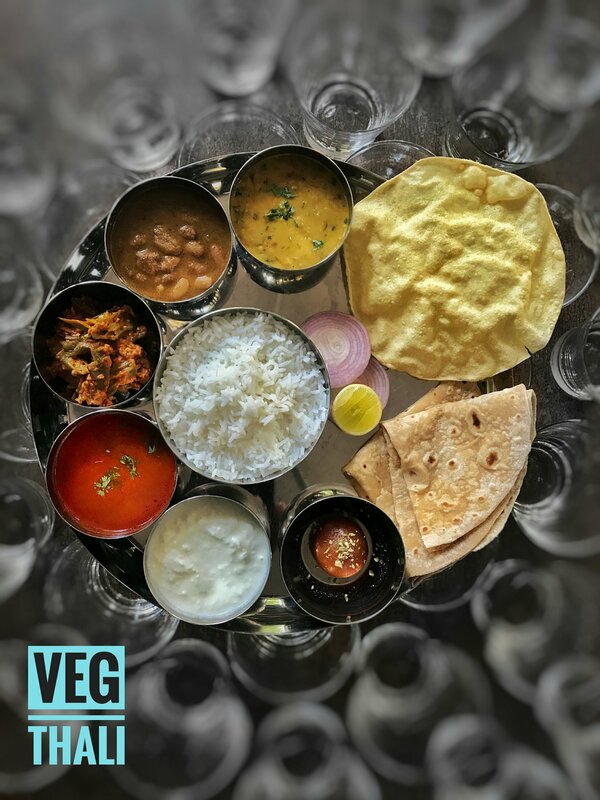 You too can relish a vegetarian thali. You cannot leave this place without trying the lip-smacking payasam made with chana dal and jaggery. The service is warm and unobtrusive. Lunch is served between 12 pm to 3.30pm. This value for money thali is a must try.